Picture this: you’re out foraging for food when you realize you’re being stalked by a tiger. Your muscles tense, your ears are filled with the sound of your thundering heartbeat, your eyesight seems sharper. You quickly run through different scenarios where you either try and outrun the tiger or find a weapon with which to fight it. Suddenly, the tiger catches sight of something tastier and is off after a deer instead of you. Now your body is flooded with relief and you feel drained, almost heavy. This evolutionarily ingrained response to being in this very real threat is what most of us call the “fight or flight response”. What’s happening at a chemical level is that our bodies are being flooded with insulin and cortisol, hormones that give us an immediate energy boost in order to deal with a threat. In the meantime, our other bodily functions are shut down. Most importantly in our conversation here, digestion is shut down. This makes sense in a life or death situation. After all, who needs to digest a meal when we don’t know whether we’re going to live long enough to benefit from the nutrients therein? Unfortunately, decreased digestion and assimilation lead to not building muscle and storing fat - exactly what we don’t want in our everyday lives not running from tigers. This is like being afraid to breathe or trying to control our heartbeat; it isn’t possible! 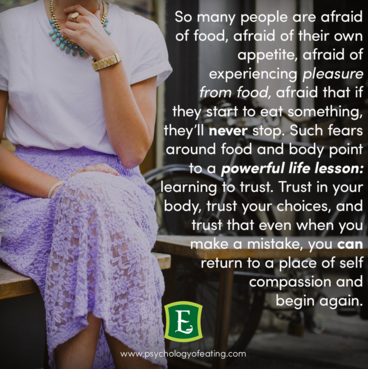 Unfortunately, when we fear our appetite, we go into a chronic, low-level stress response. Some stress is going to happen no matter what we do, and that’s normal. However, feeling stressed day-in and day-out is very unhealthy and leads to what we’ve already discussed: decreased digestion and assimilation, increased insulin and cortisol--more fat storing and less muscle building. In addition, our food can stay in our systems for a much longer period of time than our bodies are designed for. This can lead to indigestion, bloating, constipation, and heartburn, among other things. Increased insulin and cortisol can deregulate our appetite so that we don’t realize when we’re full, leading us to need to eat more in order to feel satiated. We have to welcome our appetite back to the table. Listen to your body cues. So often we sit down to eat and just have to finish what’s on our plate, or we pop a heartburn pill so we can eat that piece of pizza (or two or five). While this does seem to be the norm, that doesn’t make it natural. We have to stop overriding our bodies’ natural cues in order to be informed about the eating decisions we’re making. If you feel full, stop eating. If you know that certain foods cause you heartburn or indigestion, it is our bodies telling us to not eat them. I know these can be extremely difficult habits to break, but it is nature’s way of showing us what’s healthy for each of our bodies. Everyone is different, but everyone should tune in to their own body wisdom. Please experiment with listening to your body during meals. Take a few deep breaths before eating to calm yourself (especially if you have the toxic belief that food is your enemy). Really take notice of the food before you and enjoy it in its entirety: its aroma and color and, of course, taste. Light a candle. Eat outside. Listen to slow, relaxing music. Enjoy the people you might be sharing your meal with. Enjoy being alive and being able to provide yourself with a delicious meal. All of these things will help keep your stress response at bay and enable you to get back to basics when it comes to eating. And don’t worry, even if you notice yourself eating quickly again or feeling stressed, just come back to a relaxation response. It can take a long time for this to be the new norm, so remember that it’s a practice, not a perfect! Please also consider checking out Nourishing Wisdom by Marc David. It’s chock full of tips and factoids and I found it to be a quick and enlightening read. Thanks again for joining me! I look forward to next month, when I plan to share about a BIG one: the toxic nutritional belief “less food + more exercise = less weight”.